Computers are increasingly becoming a mandatory part every household and the children are exposed to them from their earliest days. Parents are faced with the questions like what is the right age to introduce computers to their children, what are the advantages and disadvantages of computer use and what possible health problems this may cause. By looking at their parents using computers, kids would probably want to do the same. It is not recommended for a child under 2 years of age to use a computer, or be exposed to any screen for that matter (television, consoles…) because the eye muscles are not fully developed yet. Luckily, children themselves show real interest in the computers between the age of 3 and 6. In this period, parents should gradually introduce different kinds of games that are appropriate for the age and interest of the child. Keep in mind that the development and interests of children vary on an individual basis, and while some children may show an interest earlier, others may not be interested in computers for a long time. If your child doesn’t show an interest in computers, don’t impose it on them. There is plenty of time to learn everything there is to know, when they’re older. Between 6 and 9 years of age is when most children are already familiar with the computer. If you didn’t have a computer in your house it is possible that this is when you would probably get one at the request of your child. If this is the case, do not put the computer in child’s room, but somewhere visible to you, in order to have a better idea of the amount of time your child spends playing on the computer. Teach your child that a computer is not just for playing games - this is the age when a child can get numerous educational multimedia content that can greatly expand his or her knowledge, especially when it comes to school subjects. Provide your child with good computer chair because the back has to be straight. Correct posture is very important for the development and healthy growth. The appropriate distance from the child’s face to the screen should be between 45 and 70 cm. The environment must always be well lit, but check that no source of light (natural or artificial) is reflected on the screen. When they get older, most children will already use a computer better than their parents. Internet and social networks will probably become standard means of communication of your children and their friends. During this period it should be paid special attention to teaching your child what Internet safety is and how to behave online. You can always protect your child from unwanted content and contact with parental control systems which have time slots you can easily set up. Moreover, most search engines have filtering options that can prevent unsuitable content for children from appearing. When your children hit puberty, you should expect them wanting PCs or laptops of their own. 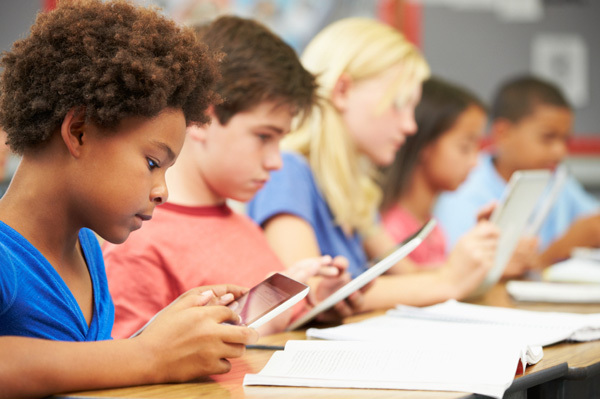 Most children are addicted to gaming and social networks in this period and they would like to have their privacy. Gaming laptops or better performance PCs are some of the things that may be on their wish-list. As long as you took your time explaining your child that there is time to play and time to study, there shouldn’t be a lot of problems in this regard. Numerous studies on the effect of computers on the intellectual, physical and social development are being done around the world, but the results are still insufficient to draw any final conclusions. A positive link between use of computer and cognitive development of preschool children from the age of 5 and up was found, but additional research is needed to determine the impact on very young children who are in the period of intensive development and acquisition of first knowledge about the world and environment. Only after years of study it will be possible to give definitive recommendations on the use of computers in the early years and its positive and negative aspects – until then, trust your judgement as a parent, respect your children’s interests and try to present proven content, appropriate for their age.